Home » Blog » Child Care » How to Manage Your Twin Babies? How to Manage Your Twin Babies? New mother of two? Still in a state of bewilderment of your beloved ‘Get one free’ prizes? In addition to that, are you wondering how to manage your two darlings at once? If it seems like a somewhat hectic job to you, know this. Most new mommies are struggling with having to care for their new-born with perfection. You have two: so there is an added bonus of responsibility. But, don’t fret! You are in the right place and about to learn some real hands-on tips about how to take care of twin babes. Can the two New-Borns Sleep Together? This is what doctors refer to as co-bedding which is completely safe. In fact, twins when sleeping together in the same cot, regulate body temperatures better and co-ordinate their sleeping cycles. This is good for both babies. There are no special rules for co-bedding- just don’t forget to put everything in pairs. Two pillows, two soft toys, two suckers and er…two babies! Well! 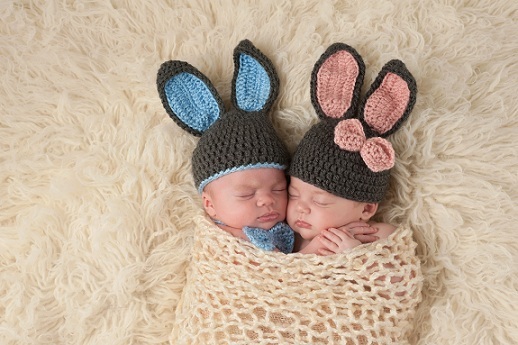 Here are some tips to follow when you’re stuck about how to manage both twins at once. Breastfeed both babies together. Try using a nursing pillow for feeding both at a time. If tandem feeding is problematic, try feeding alternately with one being breastfed and the other bottle-fed. Switch their turns during your next meal. Make them fall asleep together on the same cot. Bottle feed them together as well. Learn the inside and outs of using a double stroller. Remember to alternate holding and laying down each babe. Learn to use an infant cushion. Also, learn how to lay them on the blanket together. Be extra fast with changing diapers, because you got to do both at a time. Have equal speed with preparing their sucking bottles. Be organised with how you keep your baby stuff. It won’t be nice for you if your breast pumps are going missing while both babes are crying for attention. Plus, here’s a fact: twins have spent longer together than you have with each of them times two. Let them maintain their special bond. Don’t show favouritism to any of the two.